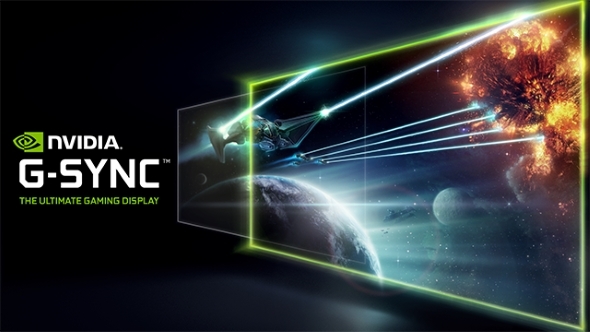 Update March 22, 2018: Nvidia have again confirmed that their 27-inch G-Sync HDR panels will start to arrive on the shelves in Q1 of this year – and that means we’ll have the first batch of 16:9 panels by the end of next month. You’re going to need one of the best graphics cards on the market to get the most out of the next generation of gaming panels. Nvidia have been speaking about the much-delayed new gaming monitors since they first appeared on the scene at CES. CES 2017. 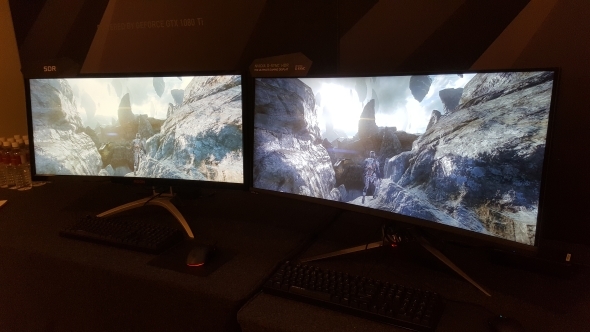 At CES 2018 they told us the G-Sync HDR screens would start to arrive in Q1 and have reiterated that expectation at GDC this week. There’s no extra explanation about the delay, but we heard from AOC that AU Optronics had only just started to manufacture the actual panels in December last year, so it’s no great surprise the actual monitors aren’t appearing until April. We haven’t heard from Acer, AOC, and Asus themselves about when the new G-Sync HDR screens will actually ship, but Nvidia seem confident. So that’s nice. The 34-inch ultrawide versions that we saw at Computex last year are still on track for a Q2 launch, so we’re guessing those will start to roll out around Computex this year. Which is also when we were being told the Nvidia Big F**mat Gaming Displays would start to appear too. Original story January 9, 2018: Nvidia have confirmed to us that the 27- and 34-inch G-Sync HDR gaming monitors are now set to all be launched by the end of Q2 this year. So, by the time Computex rolls around in the summer we ought to have more options of HDR screens than HDR-compatible games to play on them. Good times. I checked out all three of Nvidia’s 65-inch Big Format Gaming Displays yesterday, and yes they are for sure big and f-ing bright. 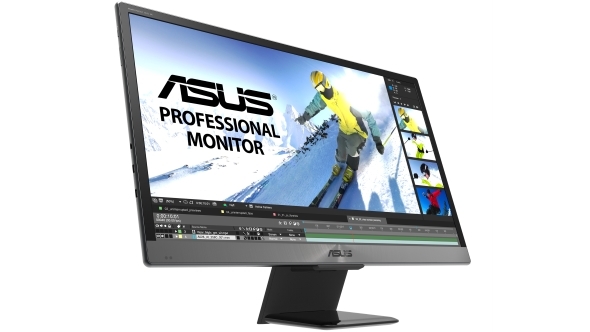 But probably also pretty unrealistic in terms of a gaming monitor that most of us would actually use in our homes. Or even be able to afford. The 27-inch and 34-inch G-Sync HDR panels are still pretty sizeable but more akin to the kinds of screens we can comfortable fit on our desktops. The 27-inch G-Sync HDR panels shown off at CES last year are scheduled to launch in Q1, while the glorious 34-inch versions we saw in the summer at Computex will hit the shelves in Q2. AU Optronics were expected to go into production with the necessary HDR panels at the tail end of 2017, with full scale production starting in December. That would chime well with the initial Q1 release. 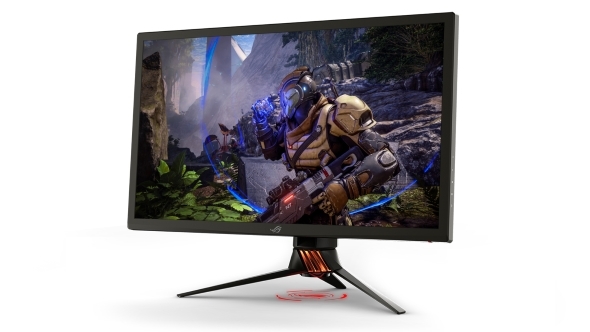 Both of Asus’ 27- and 34-inch G-Sync HDR displays were on show in the ROG booth at CES this year, though neither are ready for sale yet as they’re still waiting on full authorisation by the FCC. Incidentally the FCC are the reason that Nvidia can’t call their big fragging gaming displays TVs. Because they don’t actually contain tuners they can’t be called TVs. Who even uses tuners these days? They’re 65-inches, they’re not monitors, they’re TVs.